Natural gas is the most diversified fuel in the United States. This domestic fuel is used to cook food, fuel vehicles, generate electricity and as a raw material for products such as fertilizer and plastics. One of the most important uses of natural gas is to heat buildings and homes. About half of all U.S. homes use natural gas as their main heating source. This use results in significant seasonal variations in which natural gas consumption is highest during the winter time and lowest during mild-weather months. Natural gas storage enables supply to match demand on any given day throughout the year by adjusting to daily and seasonal fluctuations in demand while natural gas production remains relatively constant year-round. Growth in natural gas use has enabled the U.S. to be a world leader in reducing air emissions, ranging from criteria pollutants, such as sulfur dioxide and nitrogen oxides, to greenhouse gases. In 2014, researchers at the National Oceanic and Atmospheric Administration found that the increased use of natural gas in power generation has led to 40 percent less NOX emissions and 44 percent less SO2 emissions since 1997. In 2015, the Energy Information Administration determined that greater use of natural gas helped reduce U.S. electricity-related CO2 emissions by 9 percent in 2014 when compared to 2005 levels. How Does Underground Storage Work? Put simply, when natural gas production is higher than natural gas consumption (typically April through October), it can be placed into storage. 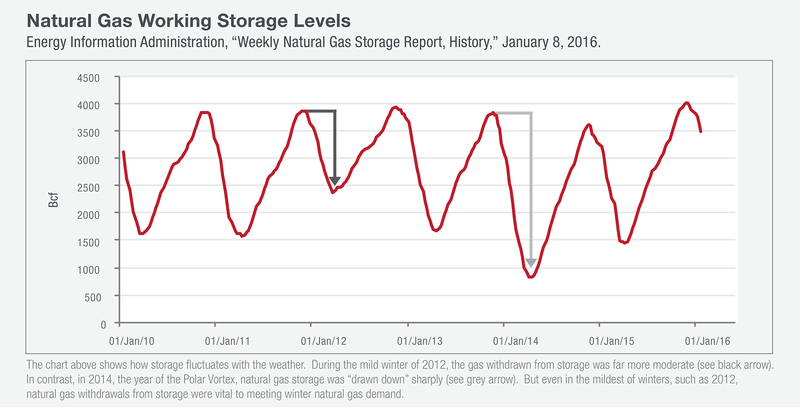 When natural gas production is lower than consumption (November through March), it can be withdrawn from storage to meet demand. In fact, about 20 percent of all natural gas consumed each winter comes from underground storage. Storage can also be used to keep natural gas flowing to customers in the event of temporary disruptions in production and also helps interstate pipeline companies balance system supply on their long-haul transmission lines. The flexibility and resiliency provided by storage is the key to maintaining reliable and responsive natural gas delivery. There are approximately 400 active storage facilities in 30 states. Approximately 20 percent of all natural gas consumed during the five-month winter heating season each year is supplied by underground storage. There are three principal types of underground storage sites used in the United States today: depleted natural gas or oil fields (80%), aquifers (10%) and salt formations (10%). Underground storage working natural gas capacity in the United States increased 18.2 percent between 2002 and 2014, helping to ensure that natural gas is available when it is needed most. Approximately 4 trillion cubic feet of natural gas can be stored and withdrawn for consumer use. Natural gas is stored underground primarily in three reservoir types: depleted oil and natural gas fields, salt formations and depleted aquifers. Natural gas may also be stored above ground in refrigerated tanks as liquefied natural gas (LNG). There are approximately 400 active underground storage facilities in 30 states. Of the approximately 400 active underground storage facilities in the U.S., about 79 percent are depleted natural gas or oil fields. Conversion of an oil or natural gas field from production to storage takes advantage of existing wells, gathering systems and pipeline connections. Depleted oil and natural gas reservoirs are the most commonly used underground storage sites because of their wide availability. Salt formation storage facilities (also known as caverns and beds) make up about 11 percent of all facilities. These subsurface salt formations are primarily located in the Gulf Coast states. Salt formations provide very high withdrawal and injection rates. Natural aquifers may be suitable for natural gas storage if the water-bearing sedimentary rock formation is overlaid with an impermeable cap rock. They are not part of drinking water aquifers and make up only about 10 percent of storage facilities. 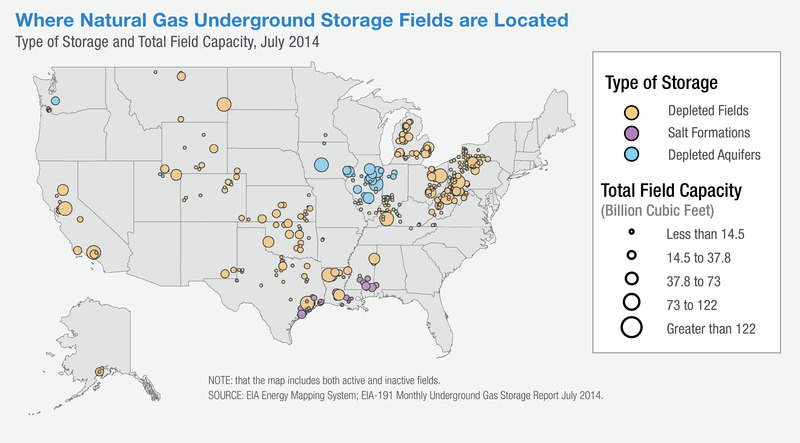 Who Owns and Operates Underground Natural Gas Storage? The owners/operators of underground storage facilities are primarily interstate pipeline companies, intrastate pipeline companies, local distribution companies (LDCs) and independent storage service providers. About 120 entities currently operate underground storage facilities in the U.S., approximately half of which are interstate and half intrastate. The Federal Energy Regulatory Commission (FERC) regulates projects connected to interstate pipeline systems. FERC is responsible for authorizing the construction or expansion of storage facilities and the terms and conditions of service (i.e., open access) and the rates charged by these providers. The Pipeline and Hazardous Materials Safety Administration is authorized to regulate the safety of natural gas transportation and storage. Intrastate storage may fall under the regulatory authority of various state government entities depending upon the state. For example, underground storage in Texas is under the authority of the TX Railroad Commission – Oil & Gas Division. Often state utility commissions as well as state environmental or natural resource agencies set the rules governing intrastate underground storage. Beyond federal and state regulation, industry has taken the initiative to work with external stakeholders to develop two recommended practices (RPs)—accredited by the American National Standards Institute—for underground storage. RP 1170 and 1171 provide guidance to operators on how to design, and operate, and ensure the integrity of underground storage for natural gas. Given the geographic and geologic diversity in storage operations in North America, no single integrity management approach, and no single integrity verification technique, is applicable or adequate for each and every storage well. Below are some of the common well integrity assessment methods used within the industry to protect their assets and the public's best interests. Storage operators check for weak points and leakage, and investigate suspicious indications through a variety of downhole logging techniques, including formation evaluation tools (e.g., neutron logging), fluid movement indicators (noise and temperature surveys), casing inspections (magnetic flux leakage and ultrasonic methods), mechanical calipers, downhole cameras, and cathodic protection profile surveys. Operators use multiple methods to make decisions on the mitigation and maintenance work that must be done to help ensure the integrity of the well. With increasing data, data analysis, and recognition of the integrity drivers, operators are using to risk-based assessments to drive their underground storage well integrity management programs. API Recommended Practices 1170 and 1171 provide more technical information on assessment and monitoring methods. In addition to tool-based assessment methods, the industry uses pressure tests and pressure monitoring as integrity assessment methods. Common approaches used by operators include shut in pressure monitoring at each well, annulus pressure or flow monitoring and mechanical integrity tests at the well. Operators may employ a risk-based approach that takes into account risks and threats specific to each well when selecting well integrity practices. Commonly assessed risks or threats include, but are not limited to the following: casing physical attributes (diameter, weight, grade), presence of atmospheric or external corrosion at or near the surface; known metal loss indications from casing inspection surveys; presence of annulus pressure or flow; water production in the well; the presence of hydrogen sulfide, bacteria, or naturally corrosive zones; if the well’s location is in an area prone to natural disasters, high population density or sensitive environmental or cultural features; flow potential of the well; the well’s role in providing natural gas service reliability; and well work history. Storage operators use their integrity assessment programs to make decisions on mitigation and maintenance well work to maintain the integrity of the well. The set of well conditions which would drive the need for remedial work are site-specific.